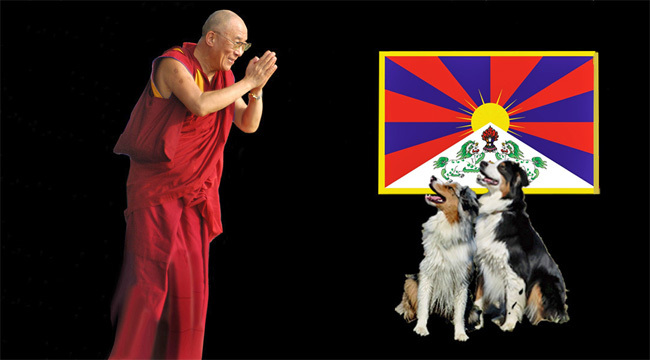 DALAI LAMA ON CROSSCURRENTS, 7/6 – Doggedly Yours… Howling, Humor, and History. DALAI LAMA ON CROSSCURRENTS, 7/6: His Holiness the 14th Dalai Lama, Tenzin Gyatso, who describes himself as a simple Buddhist monk, was born on the 6th of July 1935, and would become the spiritual leader of Tibet. Gavin and Wyatt are “mindful” of their audience with His Holiness with the Tibet flag in the background. You can be part of the KRNN audience as John honors His Holiness with a focus of happiness on Crosscurrents, 7/6 at 8 a.m.
I’m curious about what kind of music you’ll play to honor the DL, so I guess I’ll have to tune in, eh?